Sometimes Date Night is still at our headquarters in Marietta when it’s time to figure out where to go on our date. And sometimes we are busy doing other things and we wait all the way up until it’s time for dinner until we choose. And when you wait that long, you need to go to somewhere close where you can “come as you are”. In East Cobb since 2004. It seems like Ritter’s has been here for a long time. In fact, they will be celebrating their 10th anniversary in April. We “go as we are” and promptly run into Barbara and David, a couple we have known since 1996, who invite us to join them in their booth. Date Night becomes a double date. 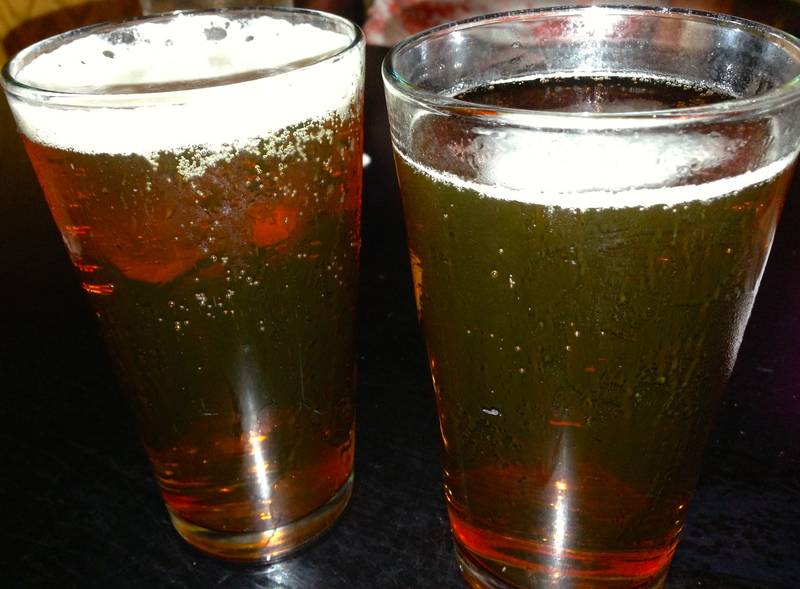 Beer with a bourbon flavor. The daily double. Eve and I hit the beer menu, which is orally delivered by our server Megan. We pick the Kentucky Bourbon Barrel Ale, which, as you can tell by the name, is aged in old bourbon barrels. This gives the beer a slight hint of bourbon, and it gives it an 8.2% ABV, which makes us happy. The special appetizer tonight is fried oysters, and since September ends in an “r”, we take the plunge. These oysters are plump and juicy on the inside and nice and crispy on the outside. The slaw has an Asian flavor. The oysters do not last long on the rectangular plate. Leave room for one of these. 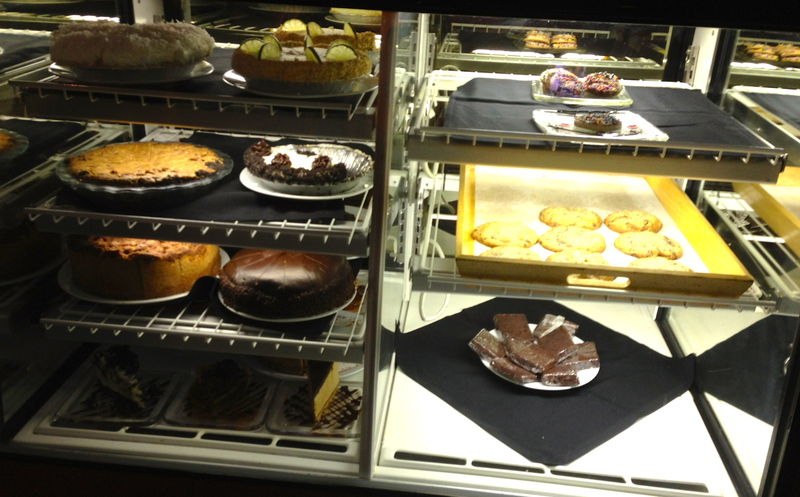 When you walk into Ritter’s you are greeted by friendly people and the dessert case. When you order your dinner, it’s in your mind that there are gorgeous desserts lurking out there and maybe you should order something light. We both stay on the light side tonight with some salad creations. 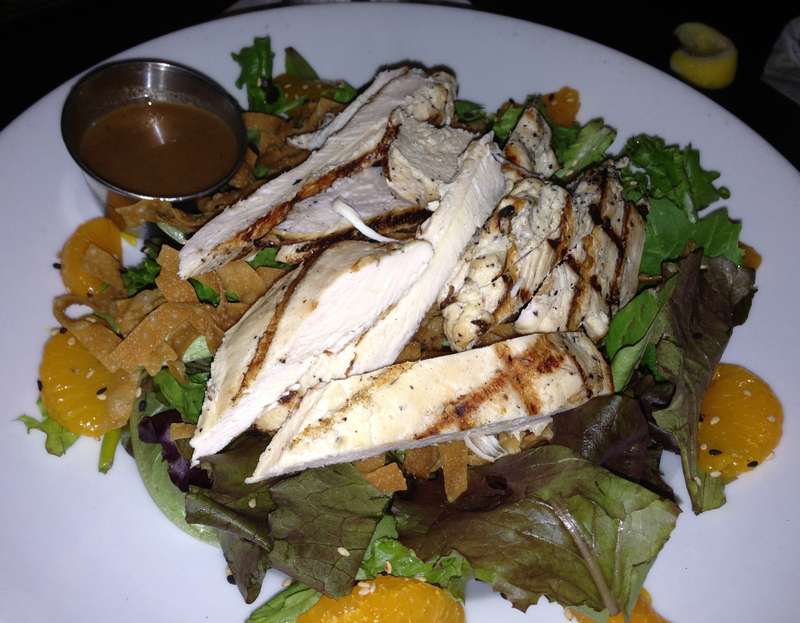 Eve goes with the Asian chicken salad, which comes with a lot of grilled chicken. She is able to take some chicken home for lunch the next day. Grouper salad with a small piece of grouper. 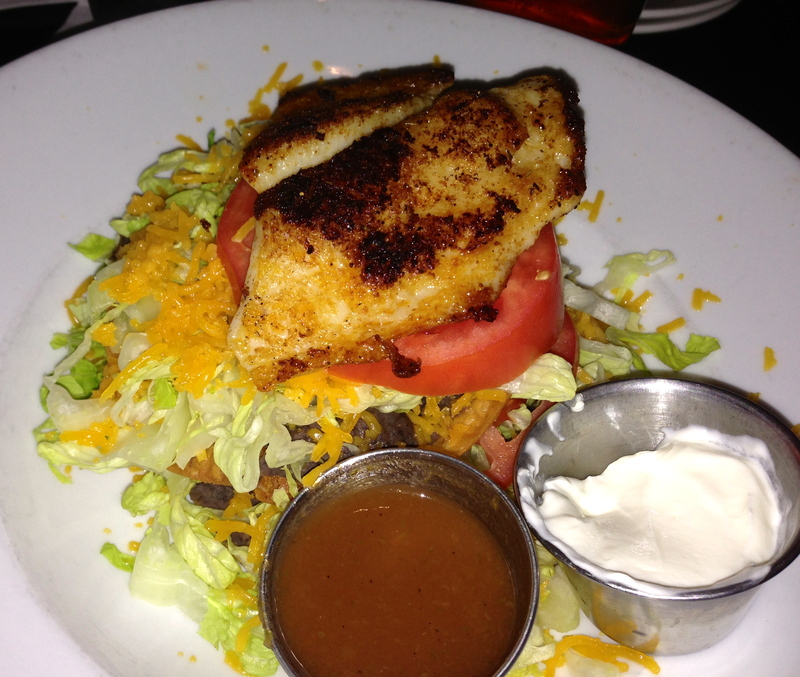 I go with the grouper tostada. Underneath the fish and lettuce is refried beans and a crispy tortilla, which manages to keep its crispness while I eat it. Many tostada shells get a bit soft by the end of a meal, but this one held up. The salad is good, but my main complaint is that for $14, you should get a much bigger piece of fish. This one barely covers that tomato slice, which wasn’t that large. As for our impromptu dinner companions, they stay with the seafood theme. Trout that swam thru a lot of almonds. 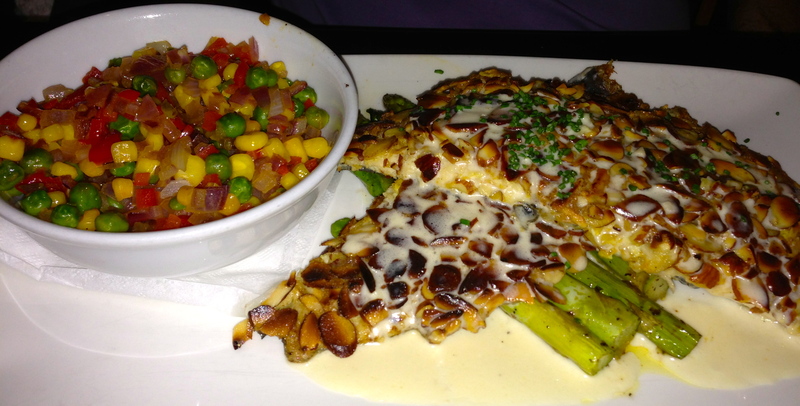 David orders the trout almandine, which is covered with almond slices. It must have been good because he ate it all. 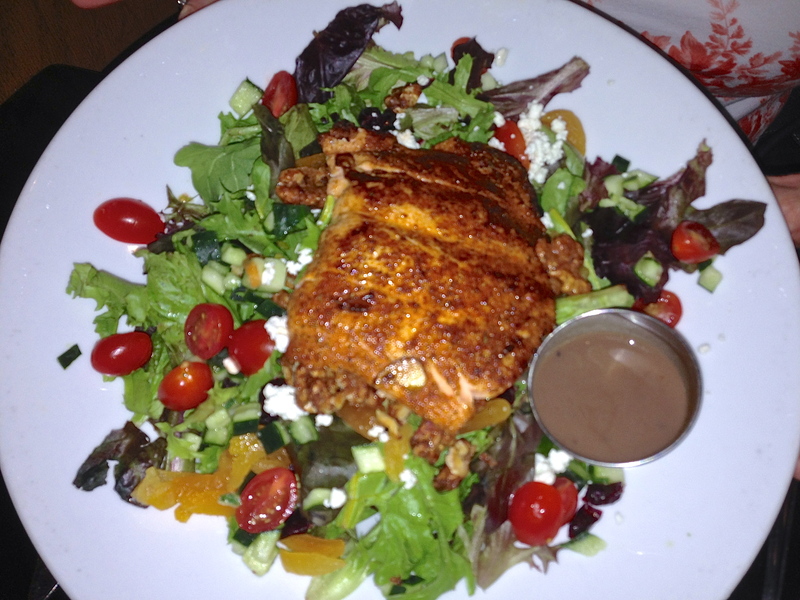 Barbara has the blackened salmon salad. There are no leftovers, so she must have liked it. I did notice that her piece of salmon was much larger than my “sliver” of grouper. Did we save room for dessert? This is Date Night–of course we did! Server Megan takes me on a personal tour of the dessert case, where she explains everything that is in there. Somehow I get the “burden” of making the dessert decision. Do I want key lime pie? Coconut pie? Warm chocolate cookie with ice cream? Death by chocolate? 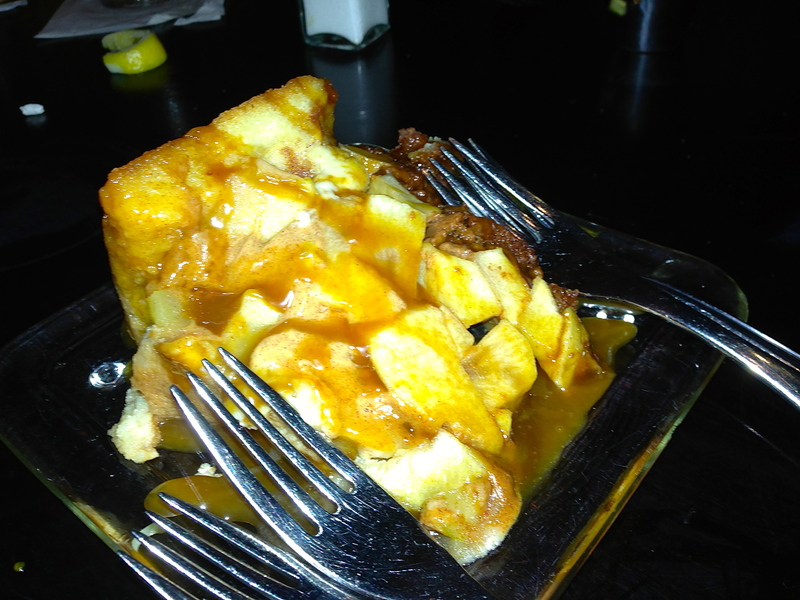 How about the deep-dish apple pie? My date loves apple pie. (Date Night trivia–in what movie does “everyone love pie”?) This is a piece of pie so thick that it’s almost like an apple cake. It’s served warm with a carmel and cinnamon sauce and we love this pie. By the way, it is “Michael” with John Travolta (1996) where everyone loves pie. 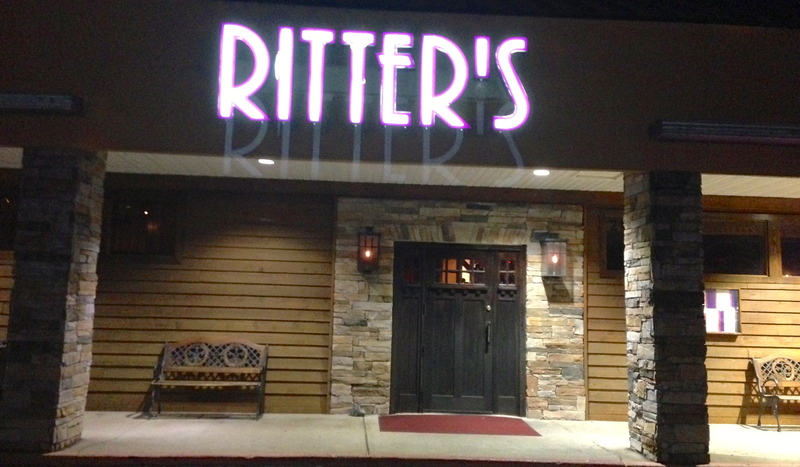 The bottom line on Ritter’s: If you live in East Cobb, this is a good, casual neighborhood restaurant. It’s never going to win any food critic awards, but after almost ten years here, they must be doing something right. Go here the next time you need to “go as you are”. You never know who you might run into!